The 12 finalists in the 1971 Loxene Golden Disc Awards, New Zealand’s premier music awards, largely represented the usual suspects of New Zealand pop/rock music. Suzanne and her cover of ‘Stand by your man’, Chapta’s sickly sweet ‘Say a prayer’ (which won the Group Award), Ray Columbus with ‘People are people’ (including the immortal line ‘People are people whatever they eat for breakfast’) and Craig Scott’s ‘Smiley’ (winner of the Solo Award) were the type of artists that music punters had come to expect from these annual awards. Timberjack was not. Their cover of the song ‘Come to the Sabbat’ (originally recorded by the English band Black Widow in 1970) opened with a drum beat and chant that recalled North American Indian music. It was quite typical of what was described as prog (progressive) rock, and it incorporated a flute theme that sounded very much like another English act, Jethro Tull. It shocked many with its chorus of ‘Come, come, come to the Sabbat/ Come to the Sabbat – Satan's there!’ The notoriety certainly helped sales. Timberjack had grown out of the Wellington band Dizzy Limits, which had enjoyed moderate success in late 1969 before heading to Britain in 1970. The band returned with its new name, and its record label, Ode, announced that ‘Black Magic and its music has finally arrived in New Zealand.’ ‘The name sounds heavy and the music is heavy, reflecting the latest trends in progressive music.’ Timberjack was promoted as a group that ‘can surpass overseas artists’. ‘Come to the Sabbat’ was to be both the beginning and the end for the band. It split up in late 1971.
whose very name soothes my heart? Come to the Sabbat – Satan's there! 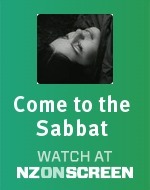 Come, come, and come to the Sabbat.